Photo courtesy of Don Borin/Stop Action Photography Mercer Island senior point guard Kailee Yan, right, makes a move against Liberty defender Jasmine Baker, left, in a matchup between KingCo squads on Jan. 4 in Mercer Island. The Islanders defeated the Patriots 64-29. Mercer Islanders senior girls basketball player Anna Luce was an unstoppable force against the Liberty Patriots in the first game of 2017 for both teams. Luce, who scored a game-high 24 points (9-for-16 from the field), led the Islanders to a 64-29 victory against the Patriots on Jan. 4 at Mercer Island High School. The Islanders improved their overall record to 7-3 with the win. Liberty dropped to 4-6 with the loss. The Islanders swarming defense surrendered just 12 Patriots’ field goals in 32 minutes of play. Mercer Island head coach Gillian d’Hondt was glad to see her team get back on track after going 1-3 at the Nike Tournament of Champions in Phoenix from Dec. 19-22. It was the first time the Islanders had played in 13 days. “We wanted to execute offensively and defensively. We wanted to work on stuff that we put in over the (holiday) break and really just get our feet back under us since coming back from Arizona,” d’Hondt said. The Islanders mission was accomplished. Liberty first-year head coach Nathan Winegar admitted Mercer Island’s defense created problems for his team. The Islanders bolted out to a 29-10 lead at halftime. 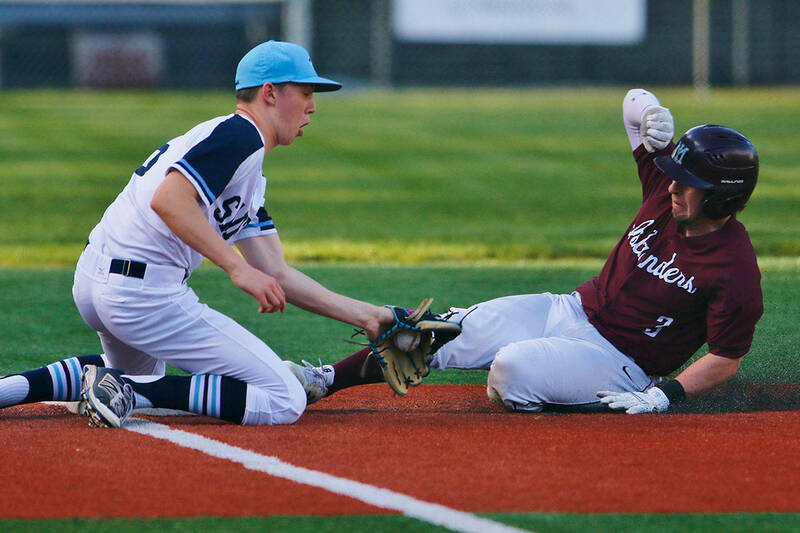 “Mercer Island is a great team with great players. Tonight it really came down to turnovers. I told the girls at halftime that Mercer Island probably only scored 14 points in their offensive set. All the rest came from turnovers,” Winegar said of the first half. D’Hondt said her team isn’t content despite being in first place in the KingCo 3A standings with a 5-0 record in league play. “We’re still building. We are never going to be satisfied. We got Bellevue and Redmond the first time around (win against Bellevue Dec. 12, win against Redmond Dec. 14). We’re looking forward to playing them again,” she said. Winegar believes his team will be just fine if they can cut down on their mistakes. “We are going to be working the rest of the year on getting those turnovers down. If we do that, we will have a lot of success,” Winegar said. “The problem right now is we’re just giving teams too many second-chance opportunities. This is a very tough league (KingCo),” he said.